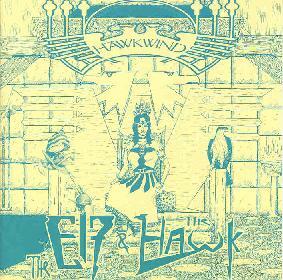 Hawkwind - "The Elf & The Hawk"
This 78 minute CD from Black Widow includes nearly (The Competition is missing) the entire Hawkfan 12 album from 1986, which was actually issue 12 of the Hawkfan zine. Also included is Alan Davey's 1987 The Elf solo EP, plus new tracks from Dave Brock, Alan Davey, and a band called PXR 1 which claims Spacehead's Phil Howard as a member. Hawkwind does a typically rousing version of "Ejection". And "Ghost Dance" is a wild tribal tune. I don't mean as in just tribal percussion beats, but chanting dancing around the campfire tribal. The Brock track, "Burn Me Up", is a very good thumping, rockin' track. Great space guitar and shooting synths. Michael Moorcock's Deep Fix does "The Tale Of The Entropy Tango" which is something of a novelty track. The music alternates with Brian Tawn telling the story of the how the tune came to be recorded. There are also four non-Hawkwind bands here, three of which were on the Hawkfan 12 album. Dark Empire, now defunct, contributes an electronic tune. Nothing special though it creates a cool haunting atmosphere. Syndrone, also defunct, is right up the Hawkwind alley. A little raw but I would have liked to hear more from them. The third non-Hawk band on Hawkfan 12 is Underground Zero, who did continue to record. This is one of the best tracks on the whole disc playing excellent space rockin' music with an aggressive female vocalist. PXR 1 is the new band who offer up a 12 minute cover of "Spirit Of The Age". And a damn good one at that. Hope to hear some original material from these guys. For my money, some of the best moments on this disc are the Alan Davey tracks. It's apparent how Davey caught Dave Brock's attention and ended up as a band member. The music is pure spacerock. Davey has a really good sense for melody (most notably on "Cosmic Dawn") and can play heavy and light equally well. I really like his electronic explorations and he can rock hard on top of those as well. "Ode To A Bass Assassin" lays down a driving, almost techno, beat while guitar blazes along with. "Fractal Hunter", one of the newer tunes, is along the same lines though it rocks out even harder. A really great track. Certainly a nice disc of archival material with some new gems as well.